Oh you guys! This giveaway has been planned for awhile and I am SO excited to finally be posting it! Surely you’ve seen the Mt. 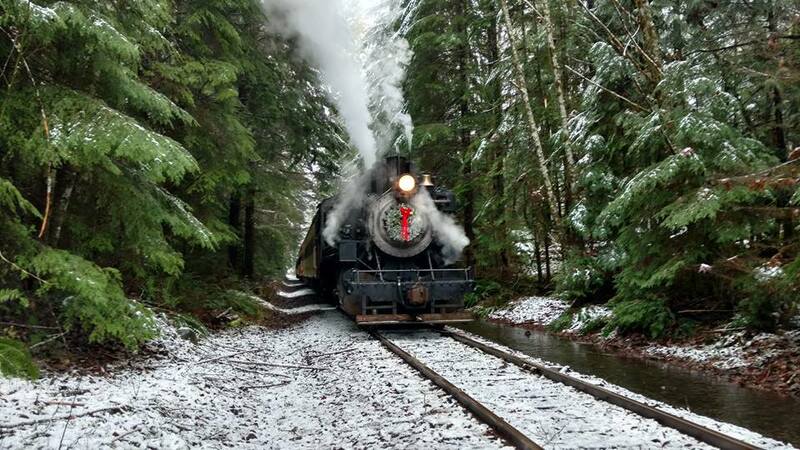 Rainier Railroad Polar Express Train Ride events all over Facebook. How could you miss it when over 62,000 people are interested?! These events are the highlight of the season for many families! Because we love our readers, because we KNOW your kids LOVE the Polar Express and because we know you’re already thinking about your Holiday plans, we have a super awesome giveaway today! Thanks to the Mt.Rainier Railroad, we are giving away a Family 4-pk of Polar Express Train Ride tickets! This is valued at over $140 and it is sure to be a night your kids will always remember. 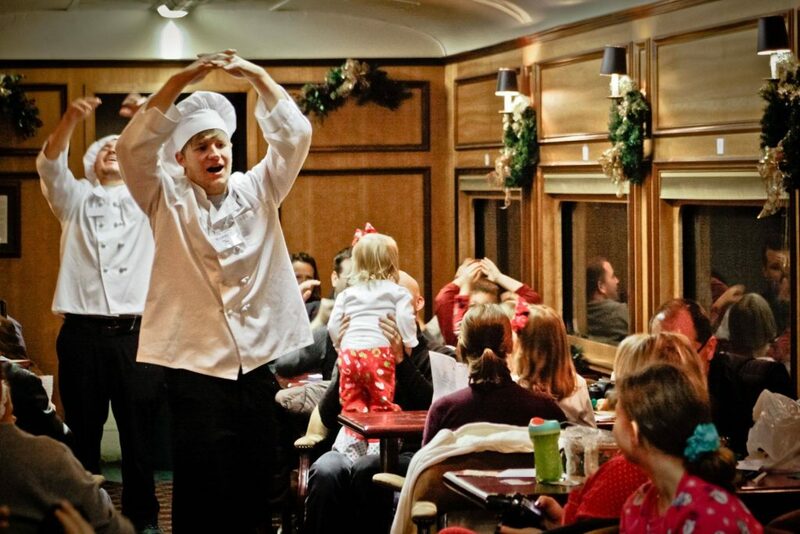 Passengers will be entertained by Chefs, enjoy Hot Chocolate and Cookies, and listen to a reading of THE POLAR EXPRESS™. Upon arrival at the North Pole, Santa will board the train and give each child the first gift of Christmas (a silver bell). This event will surely become an annual tradition for the whole family. Families are encouraged to wear their pajamas for the ride and join in on the magic of Christmas! So what happens if you win? You and your family will ride the Polar Express on Friday, December 2nd at 5:30pm. Tickets are non-transferable to please make sure this date works for you before entering. And what happens if you don’t win? Well, we really hope YOU do, but if you don’t you’re in luck because tickets are still available and can be purchased here. Enter to win the Mt. 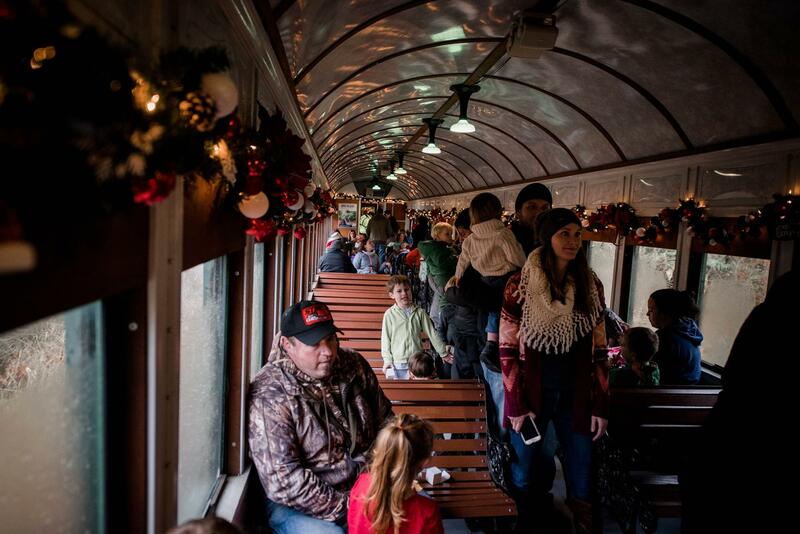 Rainier Railroad Polar Express Family 4-Pack Ticket Giveaway below! How fun! My girls have been wanting to go on a train. So many Christmas activities but one of our favorites is celebrating Swedish St. Lucias day on December 13th. A special holiday tradition that reminds us Christmas is close! I love making Christmas cookies with my children! We turn on Bing Crosby, make a yummy hot drink and just enjoy eachother! We also love making Christmas houses from homemade templates. We decorate them and cut out a hole in the back so they can “light up” on the tree. Another fun tradition that is special to my husband and I is we stay up really late Christmas Eve and make a Dutch Apple pie together for our Christmas breakfast. Christmas is my favorite time of the year! This looks like such a fun Christmas activity! Some of my favorite things to do during the holidays were thrown together in the last couple years as we filled our time together since we had moved hours away from both of our families. Lots of exploring during the holiday breaks, loads of baking (also to help heat the house for us California babies!) And every time the snow hits Daddy stays home with us and we play as long as we can feel our fingers and rush home to get warm. Every year we drive around and see the lights and decorations regardless of where we are. This year we have grandma and grandpa to help us fill the holidays with new PNW adventures! We are moving to WA this month and cannot wait to begin new holiday traditions there!! Your blog inspires me so much. Thank you! Our favorite Christmas activities are sharing small gifts, time, and love with our friends and neighbors throughout the month! We are so excited to ride the polar express this year. Our son will be 20 months in December and we love teaching him Christmas traditions that have come from both my husband and my family. Some of our traditions for Christmas include a new Christmas book each year to read of Christmas Eve. Another tradition we do is put bears (stuffed animals) under the tree instead of presents. So excited! What an awesome giveaway! One of my favorite traditions Is driving around as a family looking at Christmas lights. I look forward to the family time this time of year. Money is usually tight in the winter because it’s my husband’s slow season so we focus more on experiences than presents. I would to take my family to this! We love to do community activities and lights of Christmas! We make treats and gingerbread houses! I hope for snow this year! We also watch all the Christmas movies! Oh my goodness! My kids would be ecstatic about this! The whole family always gets together on Christmas Eve for homemade food and to exchange gifts. This is my first year in over 10 not working retail and I am so excited to be able to spend more time with family and our kids and not stress about going to work afterwards. What a fun giveaway. We have been trying to go to this for a few years now and our daughter finally likes the car long enough to make the journey to do something like this! Sounds fun! Our traditions are Christmas eve family dinner and last minute shopping and wrapping! One simple tradition we have is using a ribbon at the top of the stairs to let the kids know they can’t come down during the night. In the morning we have a big “ribbon cutting” ceremony and the kids go rushing downstairs. It’s not uncommon to find them sitting by the ribbon, bubbling over with excitement, waiting for “the cutting”. One of our favorite traditions is going to the tree farm in advance and picking out and decorating our tree before we actually take it home. And caroling. We love caroling. Oh my gosh! What a fantastic give away!! I love this idea! We have never been but I’m sure the boys would love it. We usually travel to Leavenworth inDecember to see the lights and play in the snow! How fun! We have never been or even heard of of this until seeing your post! We love Leavenworth and my daughter is coming from Virginia and it would be wonderful to be able to do this. I look forward to Christmas music all day every day, baking treats with my kids, and hoping for snow to play in!!! Wow this is an awesome giveaway! It looks like a winter wonderland! We love bundling up and drinking cocoa and enjoying the winter scenery! Such a fantastic giveaway! This is on our bucket list! We would love to do this with our family of 5 this year; how fun and magical! We love to cut down our own Christmas tree! I love going out with the family and picking out that perfect tree! Every year is better as the kids get a little bit older and can participate a little bit more! What an AWESOME experience this will be for 1 lucky family! Good luck to everyone. We love seeing the train village at Seattle center and riding the tram downtown to the carousel and Macy’s santa. So much fun! My son would love this and so would we! With three littles, Christmas seems to get better each year. We love baking cookies for neighbors and constantly hope for snow. A train ride would be fun to add :). Thanks for your blog – this year I’m asking for camping gear so we can get out next summer. Love your posts with hikes and accomplishment! I look forward to events like this!!!! Spending time with family is the best tradition we have. My sisters birthday on the 23rd. We spend all day at Grandmas on Christmas Eve and Christmas Day is spent with our immediate family. We listen to John Denver and the Muppets and open gifts by the tree. Our favorite traditions are being made now! Our children are still little so we are just beginning new traditions. We have a special “family oriented” gift from our elf in the shelf that helps us spend time together as a family, especially since we move around the country with my husband’s job. This will be our second year doing this and this giveaway is a perfect example! We did this a few years ago. Good fun . One of my favorite traditions started when my son was one year old. We like to turn off all the lights except the Christmas tree, turn on some Christmas music and have a dance party. Every day in December. It’s fabulous and simple and fun. What an amazing giveaway! This sounds like so much fun! This looks like a very fun Christmas tradition to start with my son! My boys would love this experience! I haven’t done the Polar Express excursion yet but I’ve been on others and Mt. Rainier Railroad never disappoints! I have been meaning to go on this one since we moved to PNW last year. Such a fun ride to spend with the family, definitely something to do this winter. What a fab giveaway! This would be a perfect holiday theme trip for my little ones before baby bro arrives in January! Looks like so much fun! Would love to start this as a new family tradition! Our favorite traditions used to include spending a day st StoneyRidge Farm- drinking hot cocoa, riding in the wagon, & picking a Christmas Tree, & of course, baking “Santa’s” cookies on Christmas Eve in our newly-opened Christmas jammies & reading the original Christmas Story, the birth of Jesus. This looks like so much fun! Makes me so excited for Christmas and can’t wait to watch Logan experience the magic of Christmas! Our traditions include hiding a glass pickle ornament in the Christmas tree. We also have a Danish elf, or nisse, that brings treats, small gifts, and creates mischief throughout the month of December. On Christmas Day, we always pile into the car and visit Snoqualmie Falls, rain or shine, even if it’s just for a few windy misty minutes. Thanks for hosting the giveaway! The holidays are filled with opportunities to make memories with family. My kids are still young so we are developing new traditions each year. Something that never changes is Christmas morning and that time together seeing the excitment on the kids faces listening to Christmas music and making breakfast as a family. This train ride has been on our list to do with the boys, what a fun giveaway thanks for this opportunity! This looks so magical!! One of my favorite family traditions is watching the lighting of Leavenworth! Another is making Lebkuchen cookies! I am so looking forward to all the family time and eating in November and December! I’ve always wanted to do this!!! It looks like so much fun! We love getting a live Christmas tree each year. With a small living space we now get a living Christmas tree instead of cutting one, and plant it after the holidays. We also love making Christmas cookies, going to Lights of Christmas and reading a Christmas book each night during the advent season :). What an awesome adventure gift! We love to hang homemade paper snowflakes with our kids as early in November as we dare to ring in the start of the Christmas season. We have a homemade advent calendar with a little copper star that our kids get to take turns moving from one pocket to the next, and each night my husband and I set the star up with two little bendy elf ornaments in all sorts of places for the kids to find each morning (sort of like elf on the shelf, only not quite). Another of our favorite traditions regarding gift-giving includes taking our four children (ages 5 and under) to the toy store to look for ideas of what they want to give each other and make a list (my husband and I scout it out kid-free a few days beforehand to minimize overwhelm and meltdowns lol). When we get home, we make a list of jobs they can do to earn money to save up for their gift idea, and then later return to the store with their hard-earned money, let them secretly get the item they want to give, and purchase it themselves. They love feeling so important and grown-up, and the gift has so much more meaning to them.